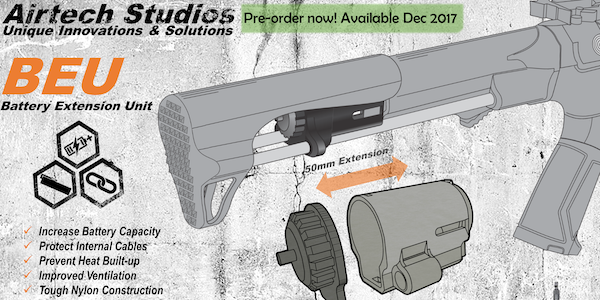 Something handy for the G&G ARP9 and ARP 556 owners! By popular demand from our followers and abundance requests from our retailers, we are on route to manufacture a Battery Extension Unit (BEU) for the popular G&G ARP9 & ARP556. Players have been loving the performance of this highly anticipated gun with it's new electronic gearbox technology, but have struggled to utilize larger batteries for their setup. With the help of the BEU, users will be able to utilize larger batteries especially with the G&G drum mag to improve their Airsoft experiences with the gun. Also, it acts to help protect the cables and program unit from over bending.